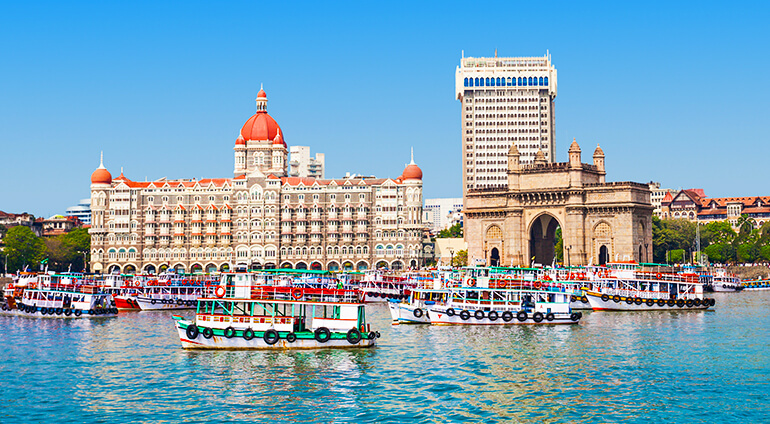 An obvious place to start is by visiting the famous Gateway of India. It’s an impressive monument that was built during the British rule and it sits on the waterfront. Most visitors to Mumbai will make a special effort to see this unique landmark. Other buildings worth seeing include the Chhatrapati Shivaji Terminus, which is a World Heritage Site and the The Shree Siddhivinayak Ganapati Mandir, which is a Hindu temple. As Mumbai is the centre of everything Bollywood in India, Film City is well worth a visit. Here you can go on tours of Bollywood sets and appreciate the creativity that goes into these spectacular movies. During your stay, you will probably feel the urge to escape the busy city. There are plenty of places to get away from it all, including Sanjay Gandhi National Park a protected green oasis in the middle of the city that’s home to over 40 species of mammals. Marine drive offers a seafront boulevard with a beautiful corniche lined with palm trees and art deco buildings. Another big attraction here is Elephant Island, known as ‘the city of the caves’. Here you can navigate through a labyrinth of caves, see some temples, sculptures and meet the cheeky monkeys that call Elephant Island their home. Mumbai also has some great beaches where you can catch some sun, some of the best known beaches are the beaches of Juhu and Chaupati. Unwind and take a cool dip in the Indian Ocean.